Weather Information Service Engine Project (WISE) is dedicated to resolve urban environmental issues including high-resolution weather forecasting, urban flooding prediction, road meteorology and urban carbon dynamics, and new urban service systems to minimize and mitigate the impacts of natural disasters and climate change on urban dwellers. WISE is targeting South Korea’s capitol, the megacity Seoul, and surrounding urban areas. Recently they started a project called the City Energy Monitoring System, focused on researching greenhouse gas emission from cars, buildings, and the people in Seoul City. As part of the project they are trying to analyze how concrete buildings, houses, and asphalt roads in the city interact with nature, such as rivers and parks that are in and surround the city. One of seven weather stations installed by B&P international for WISE project City Energy Monitoring System. To fill this study B&P International installed seven weather stations throughout Seoul city. 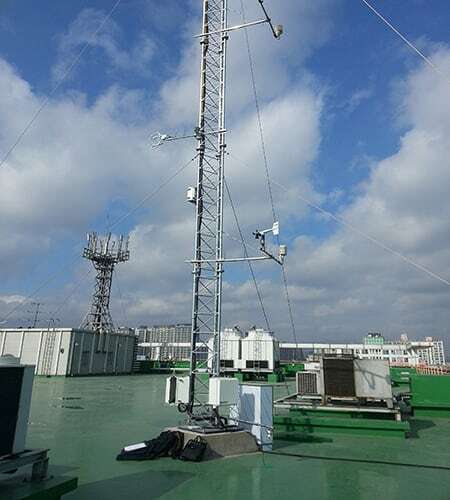 Six of the weather stations were installed on building roof tops, while the final station was installed in a rural area near Seoul. The stations are being used to monitor air temperature, humidity, wind, net radiation, CO2/H2O concentration etc. as well as building surface temperature. Building surface temperature is being measured with Apogee SI-111 Infrared Radiometers, temperature probes, and infra-red cameras. SI-111 Infrared Radiometer monitors building surface temperature. Data collected from the temperature probe and the SI-111 at the same site are being compared and analyzed. The SI-111 is being used as the standard for accuracy, as measurements from the temperature probe may be heated by solar radiation. As the data is collected, it is transmitted to a computer at the WISE office using 4G LTE modems. From there the data is uploaded to the WISE website, where it can be viewed in real time for analysis.